The earliest stage of hypothyroidism is subclinical hypothyroidism. In this stage, a person may have an elevated level of thyroid-stimulating hormone (TSH) in his or her system that falls just below the upper limit of what is considered normal. Like pre-diabetes serves as a precursor to Type 2 diabetes, subclinical hypothyroidism is a warning sign that there is a problem with the thyroid gland. Unfortunately subclinical hypothyroidism can present no symptoms or very mild symptoms that are easily explained away or ignored. As a result, a person may not receive treatment in time to prevent the onset of hypothyroidism. The causes of subclinical hypothyroidism are the same as those that lead to the development of overt or clinical hypothyroidism. 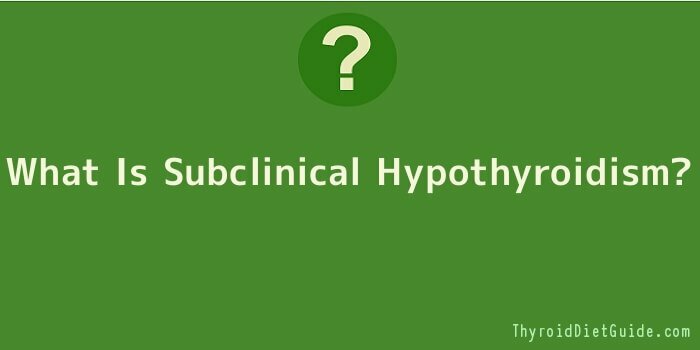 It can be challenging deciding when to treat subclinical hypothyroidism. Waiting too long to treat the condition can lead to the onset of clinical hypothyroidism. On the other hand, treatment may not be necessary if the cause of subclinical hypothyroidism is temporary and production of thyroid hormones is expected to resume to normal levels in a short period of time. If the condition causing subclinical hypothyroidism is expected to continue adversely affecting thyroid production levels, then you should start a treatment program as soon as possible. This will inhibit or prevent the onset of the medical complications associated with low thyroid. Since subclinical hypothyroidism is the earliest stage of the condition, you may not need the synthetic hormones that are typically prescribed to treat hypothyroidism. Instead, naturopathic hypothyroidism remedies may be more appropriate.